Freetown, Sierra Leone, September 21, 2018 – In his capacity as Commander-in-Chief of the Republic of Sierra Leone Armed Forces (RSLAF) and Minister of Defence, His Excellency the President Brigadier-General (Retired) Julius Maada Bio has decorated three senior military officers, who were recently promoted from the rank of Colonel to Brigadier General. These decorated senior military officers include Brigadier General Augustine Kini Fefegula, Brigadier General Victor Vengeh Samba and Brigadier General Daniel Fred Alpha. At a ceremony held at State House this morning, the Chief of Defence (CDS) of RSLAF, Lieutenant General Brima Sesay expressed thanks and appreciation to the Commander-in-Chief and Minister of Defence for approving the promotion of the three senior military officers. The CDS noted that promotion to the rank of Brigadier General is not earned by every officer. “It is the most covetous rank for a few chosen, seasoned and accomplished senior military officers with good leadership qualities, proven track record, strategic thinking, and problem-solving techniques and there is no doubt that these officers have satisfied all these requirements to earn the covetous rank”, the CDS maintained. 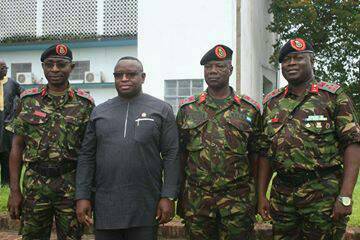 In his keynote address, His Excellency the President, Brigadier General (Retired) Julius Maada Bio congratulated the three senior military officers for the “well-deserved promotion”. Reflecting on his days in the military, President Bio said that the RSLAF has gone through the turbulent period but it was important for every military man to learn lessons from the bad history. He added that as a proud military man, he would help the RSLAF make the country proud as a nation. The RSLAF Commander-in-Chief appealed to the rank and file of the military to always imbibe the core military values of discipline and focus. He recalled that throughout his presidential bid, he received “a lot of bashing for being a soldier” but he overcame the odds because of his continued focus. “I knew my objective and I avoided all distractions and remained focused on the objective”, President Bio revealed. On Thursday 13 September 2018, the promotion of 17 senior military officers was announced. Three Colonels were promoted to the rank of Brigadier General and they have been decorated this morning with the new rank while 14 Lieutenant Colonels were promoted to the rank of Colonel. However, they are awaiting decoration in the new rank. The 14 Lieutenant Colonels include Lieutenant Colonel VA Sorie, Lieutenant Colonel ARD Rogers, Lieutenant Colonel MB Kargbo, Lieutenant Colonel Kelfala Kamara, Lieutenant Colonel Talieu Michael Brima, Commander Philip Juana, Lieutenant Colonel Sahr David Ngaujah, Lieutenant Colonel Kemoh T Sesay, Lieutenant Colonel Abdul Bangura, Lieutenant Albert Jusu, Wing Commander Philip J Schenks, Wing Commander Hassan S Coomber, Lieutenant Colonel Saidu M Conteh and Lieutenant Colonel Sulaiman S Massaquoi. Be the first to comment on "RSLAF Commander-In-Chief Decorates Three Brigadiers"